I visited the Natural History Museum in New York earlier this year and was seriously impressed by the real-time earthquake display. Despite my earnest pleas they cruelly refused to let me take it home with me; instead I stole copied created my own version of their concentric circle filled goodness. Like the exhibit that inspired it, Worldwide Earthquakes shows not just the epicentres, but also an approximated 'damage zone' (inner circle, dark shading) and 'felt zone' (outer circle, thick border) to give an impression of the areas likely to be affected by each earthquake. Zoom in to see which cities and suburbs will feel the tremor, and which are at risk for property damage. Red circles show quakes within the last 24 hours, yellow are within the last two days, and grey are everything that's left (up to the last 2 months). As a bonus, unlike the IRIS/USGS display at the museum, I use multiple data sources to get better world-wide coverage. I include feeds from the Geoscience Australia, the US Geological Survey (USGS), and the European-Mediterranean Seismological Centre. Big quakes (>5) should be picked up by all the agencies -- but in any case, I've mashed up all three feeds to produce the 'World' tab that shows only earthquakes that people can feel (>3). Now, if you've got a 30" plasma, you can have you own 'at home' real-time earthquake display. How sweet is that? Note. 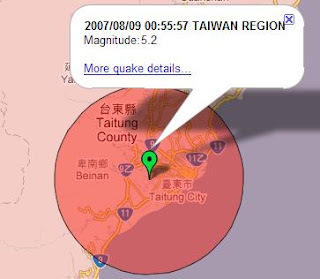 The Worldwide Earthquake mashup was constructed using Google's Mashup Editor, with additional data processing done using Yahoo Pipes. Read more information on using Pipes to help construct mashups with GME. I Love your programm, is it possible to build something similar with volcano eruptions??? I would love to have that to!